When strangers stare at Christine Kathurima Lee on the subway or try to touch her dark skin, her Korean husband puts it down to her being special. While the stares from people on the street unused to foreigners can try her patience sometimes, the Kenyan radio presenter said husband Rich has his own take on things. “He’ll say: ‘It just reminds me that you are unique,’” said Christine, who moved to Korea with him in 2010 after wedding while attending university in the U.S.
By then she had already overcome the bigger hurdle of getting her Korean in-laws on their side. “His mother was very approving but his father was not. He didn’t say we shouldn’t get married ― he said we wouldn’t,” Christine recalled at a panel discussion on intercultural marriage in Seoul last week. However the frosty patriarch eventually thawed when she became his caregiver while he was ill with cancer in the States. “In the end he said: ‘Yes, you can marry this girl.’” Christine said. From then on, married life with a Korean has been enjoyable and interesting, she said ― though her husband now knows far too many of the Kimeru insults she used when they bickered early on in their relationship. “It is a language from deep in the mountains of Kenya. It uses a lot of animal references, but he has learned a lot of the words now so I need some new material,” she joked at the Seoul International Women’s Association forum last week. In contrast, others among the four panelists said their Korean spouses’ “silent anger” was a cultural difference they had to overcome. While magazine editor Stephen Revere said his Korean language skills had helped him get to know her family, prolonged silences from his wife were sometimes an issue. “When she gets angry, in certain situations she doesn’t want to talk for half an hour, an hour or even a day. I think that may be particular to Koreans, that is a little bit of a challenge to me,” said Stephen, who founded expat lifestyle publication 10 Magazine. The counselor and TBS presenter conceded that her partner Ahn Young-bae’s “man pout” had seemed to help the couple when his mother disapproved of their marriage plan. “We got 20 minutes of ‘no’ and then my husband did his typical man pout,” Lara recalled. Steve McKinney’s speedy proposal to his Korean girlfriend prompted concern among his family back in the States. “I asked to marry her on the second date,” said Steve, who met Song Chong-ok while in Korea working for the U.S. government. “The Korean side accepted me very quickly, but the other side was more cautious,” the president and CEO of McKinney Consulting recalled. They are still happily married after 30 years. But Steve, who is also vice president of the New Seoul Council for Honorary Citizens, was shocked to find prejudice in his home state of North Carolina ― through incidents in the hairdressers and the grocery store. “Here was someone I loved and cared for being shown prejudice. I was really shocked by that,” he said. 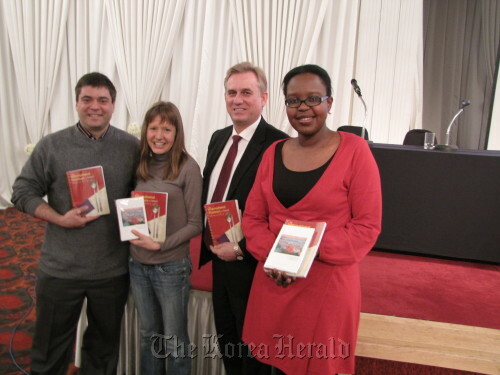 Although the different outlooks of Korean collectivism and western individualism have affected their relationship, like Christine, he said shared Christian faith had helped the couple find common ground. “Once you have a Korean friend, you will never lose that. It is a different kind of relationship,” he added. While Chong-ok won over Steve’s family by cooking typical Southern U.S. food, Lara became popular with her husband’s colleagues by introducing donuts to the Korean police force.